Eowyn (pronounced A-o-win) Ivey was raised in Alaska and continues to live there with her husband and two daughters. Her mother named her after a character from J. R. R. Tolkien’s Lord of the Rings. Eowyn works at the independent bookstore Fireside Books where she plays matchmaker between readers and books. The Snow Child is her debut novel. 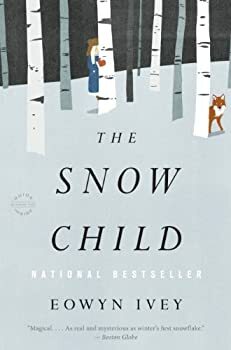 The Snow Child is informed by Eowyn’s life in Alaska. Her husband is a fishery biologist with the state of Alaska. While they both work outside of the home, they are also raising their daughters in the rural, largely subsistence lifestyle in which they were both raised. As a family, they harvest salmon and wild berries, keep a vegetable garden, turkeys and chickens, and they hunt caribou and moose for meat. Because they don’t have a well and live outside any public water system, they haul water each week for their holding tank and gather rainwater for their animals and garden. Their primary source of home heat is a woodstove, and they harvest and cut their own wood. CLICK HERE FOR MORE BY EOWYN IVEY. She had imagined that in the Alaska wilderness silence would be peaceful, like snow falling at night, air filled with promise but no sound, but that was not what she found. Instead, when she swept the plank floor, the broom bristles scritched like some sharp-toothed shrew nibbling at her heart.